Education, first step toward a bright future is the right of every child. Every parent wants their child to get the right education and live a successful life. If you are planning to begin your child's education in 2014 then read our article on Vidyarambh Ceremony Muhurat 2014, and take your child toward the right path. Vidyarambh or commencement of education is an important occasion in every child's life. Education is the base of our thoughts and values and makes us cultured and civilized. When a child becomes eligible to learn and understand, his parents perform Vidyarambh Sanskar. Vidyarambh Sanskara is the ritual which is meant for starting the education of a child. Vidyarambh Ceremony Muhurat 2014, can help you to a great extent if you are planning to begin the education of your child in 2014. Importance of education is understood by one and all. If we are educated we have the ability to differentiate between right and wrong. It is Vidya that educates us of about our rights and duties, not only in our family but also in the society. Imparting knowledge and wisdom to children helps them to contribute in the growth of our nation. Life without education has no meaning as without education, we cannot survive in today's world where competition is found at every stage. Uneducated people are unable to guide their children in the right direction. Education is not just the ability to read and write, but also bless one with a living standard and stable economy life. For a better and developed nation, education to one and all is the utmost thing. Also, it helps in eradicating poverty which is one of the major issues our country is facing. In Vidyarambh Sanskar Ceremony, a teacher introduces alphabets to a child. In the below mentioned table, we have provided details about Vidyarambh Ceremony Muhurat 2014. So, now as we have Vidyarambh Ceremony Muhurat 2014, let's get started with explanation of Vidyarambh Sanskar. If you are planning Vidyarambh Sanskar for your child in 2014, Vidyarambh Ceremony Muhurat 2014 is the first thing to be considered. Under Vidyarambh Ceremony comes worshipping of Lord Ganesha and Devi Saraswati. During Vidyarambh, the teacher sits in the east direction and the child sits in the west direction. 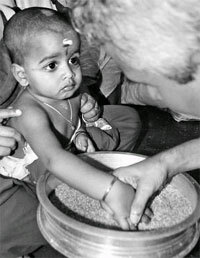 After seeking blessings from God, alphabets are introduced to the child. It is believed that Vidyarambh Ceremony should be done when the child completes five years of his life. Before commencing Vidyarambh Sanskar Ceremony 2014, don't forget to determine the favorable nakshatras. According to astrology, Ashwini, Swati, Chitra, Shravan, Abhijit, Hast, Pushya, Revathi, Anuradha, Jyestha and Punarvasu nakshatras are auspicious. As per Panchang (Hindu calendar); Second, Third, Fifth, Sixth, Tenth, Eleventh and Twelfth tithi are good for Vidyarambh Sanskar. To conduct Vidyarambh Ceremony; Monday, Wednesday, Thursday and Friday are the most auspicious days. If either Taurus or Gemini is placed in the seventh house and a benefic planet is posited in the tenth house and the eighth house is devoid then, such a combination makes the Ascendant auspicious for the purpose of Vidyarambh. According to Astrology, Vidyarambh should not be conducted at the time of Chandra and Tara Dosha. We hope that with Vidyarambh Muhurat 2014, you will get the details of when to start the education of your child. Vidyarambh Sanskar Ceremony 2014 is created by our experts and is definitely the best step you can take for the successful future of your child.